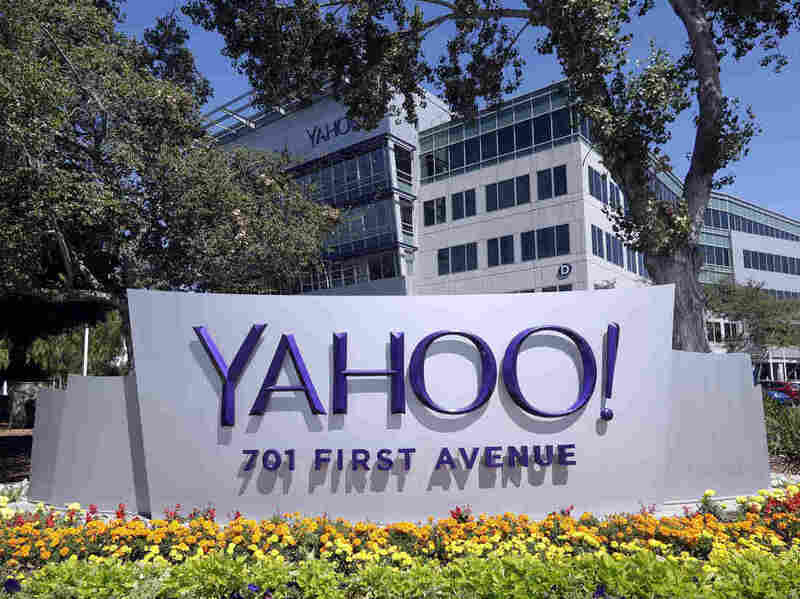 Yahoo Will Become 'Altaba' If Verizon Buys Its Internet Business : The Two-Way If the $4.8 billion deal goes through, more than half of the company's current board members, including Yahoo's CEO, Marissa Mayer, will step down. Yahoo's headquarters in Sunnyvale, Calif, in July 2016. It's still unclear whether Verizon will follow through on a $4.8 billion deal to buy Yahoo's core internet business, but if the sale is finalized, there's a name for what will be left behind. For months, as the deal has made its way through negotiations and regulatory reviews, Yahoo referred to the hypothetical remains of its business as "RemainCo." Now, the company has unveiled a slightly less literal name: "Altaba." "Altaba's remaining assets include Yahoo's stake in Alibaba Group Holding Ltd. and Yahoo Japan. The name is a combination of the words 'alternate' and 'Alibaba,' a person familiar with the matter said." As The New York Times points out, the name is very close to "Al-Taba," a Pakistani scissors manufacturer. The sale would also bring big changes to Yahoo's current leadership. According to a regulatory document filed with the Securities and Exchange Commission, six members of the company's current 11-member board would step down — including Marissa Mayer, Yahoo's chief executive. Eric Brandt, who joined Yahoo's board in March 2016, would take over as chairman of Altaba's board. He is a former executive at Broadcom, a semiconductor company. As of Thursday, Brandt took over as chairman of Yahoo's board, replacing Maynard Webb, who had served in that position since 2013 and now becomes the chairman emeritus. According to the regulatory filing, the purpose of the change was "to facilitate the transition of the Company to an investment company" following the sale to Verizon. But it's still unclear whether the sale will go forward. Following revelations of multiple major hacks of Yahoo user accounts, Verizon said it would "evaluate" the potential impact on the deal. Last week, AOL chief executive Tim Armstrong told CNBC that "I remain hopeful the deal will close and I think we'll see what the outcomes are of the Yahoo investigations in the meantime." Verizon purchased AOL in 2015. Also last week, a senior executive at Verizon said the company was unsure about its plan to buy Yahoo's Internet business. "I can't sit here today and say with confidence one way or another because we still don't know," said Marni Walden, president of product innovation and new businesses at Verizon, according to Reuters. Speaking at the Citi 2017 Internet, Media & Telecommunications Conference in Las Vegas, Walden said that if the deal does go through, "we think it will take weeks at least. We don't have a desire to have it drag on forever, that's not our intent."